Musadiq Iqbal is one of the lucky ones - he will soon be moving to his new earthquake-resistant house after his old one collapsed in the 8 October, 2005 quake. 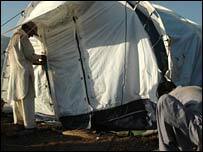 Only a few are in his position in Katahi, some 50km (25 miles) south-east of Muzaffarabad in Pakistan-administered Kashmir. In most cases, compensation has not been paid or does not meet the costs of the compulsory new quake-resistant design. Thousands in this mountainous region will have to brave a second chilly winter in temporary shelters. Under the World Bank-funded government compensation scheme, each home owner is to receive 150,000 rupees (nearly $2,500) in three instalments to reconstruct his or her house. Those whose houses were partially damaged get 50,000 rupees for repairs. 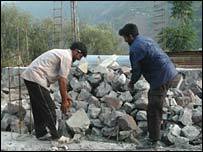 Musadiq Iqbal has used savings as well as his compensation and reckons the final rebuild cost will be 400,000 rupees. Workers are busy giving the house its final touches and he is hoping to move in just before winter. People must rebuild according to specifications approved by Pakistan's Earthquake Reconstruction and Rehabilitation Authority (Erra). But many in Katahi complain about late payment of the housing grant. Long queues can be seen outside banks. Delays are also being caused by disputes over compensation. Asim is one of thousands in Katahi who are still waiting for their money. The cause of non-payment is put down to errors in his personal details on the registration form. He has no savings so lives in hope of getting the money to restart his life. 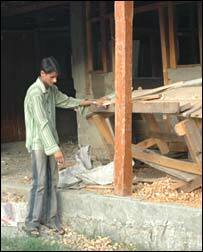 Even if he is paid now, Asim won't be able to rebuild his house before winter and must remain in temporary shelter. Many of those who started rebuilding had to stop halfway because compensation was insufficient or has not yet arrived. Imtiaz Kashmiri, another Katahi resident, got as far as laying the foundation of his new house before he ran out of money. He spent whatever savings he had, hoping the housing grant would arrive in due course - but after a year it has still not come. Now he has no option but to spend another winter in a makeshift camp. Every time Mr Kashmiri visits Erra's Muzaffarabad office to claim his money, he is told to wait as the survey team that assessed his damage has not mentioned which type of house it was. There are believed to be more than 10,000 home owners who have not been paid because of such small disputes. The authorities claim that money has been transferred to the accounts of about 194,000 home owners out of 225,000 whose houses were either destroyed or partially damaged in rural areas of Pakistan. They say others will be paid only after the disputes are settled. But non-payment of compensation is not the only factor hampering the reconstruction work. Skilled workers are also in short supply and are demanding higher wages. Muhammad Salim Kiani said he had prepared the ground and purchased materials for his new home but could not find masons or carpenters. The pace of the reconstruction is very slow - despite the fact that most people have received the first instalment of compensation. As well as red tape and high reconstruction costs, villagers say a heavy monsoon has also not helped. The situation in Meera Bakote, a village close to Katahi, is no different. Most people have yet to start rebuilding. People complain the official compensation figure does not take into account rising costs. With many roads and bridges still not repaired, hauliers are asking for more than double the fare they charged before the earthquake to deliver materials to rural areas. Construction industry experts say building an average house according to Erra guidelines costs approximately 400,000 rupees. But for those far from a main road or town, that figure can rise to 700,000 rupees - far more than the housing grant. Many people are also sceptical about building houses out of bricks and mortar, as recommended by the authorities. They say the materials push costs up and are not safe, as well as being difficult to transport. "We cannot build concrete houses because we saw our children, family members and relatives crushed under the stones in the earthquake," says Muhammad Sadiq in Gujjar Bandi, another village near Katahi. "The concrete houses also involve huge cost and they are unsafe as well." He suggests wood as an alternative. Hasan Ahmad Hasaan lives in a village with no road access more than 2,000 metres above sea level. He says it is near impossible to build the type of earthquake-resistant concrete house which the authorities want. He, too, favours wood. People's anger seems to have forced Erra to realise some of their difficulties. Sardar Sadiq Khan, director general of reconstruction and rehabilitation, said people in remote areas were now being allowed to build wood houses rather than concrete ones. This decision had been made "keeping in view the difficulties in transportation of building material to inaccessible areas and high transportation cost", he says. Locals say if the decision had come sooner they could have built houses before winter and accuse Erra officials of being out of touch. Reconstruction in the regional capital, Muzaffarabad, and Bagh to the south has not taken off because the government has yet to finalise master plans for the two cities. Under the proposals more than 5,000 families will be relocated because they live near fault lines or roads which are to be widened. Those in Muzaffarabad are to go to proposed satellite towns nearby, but the land has still not been purchased. Asian Development Bank country director Peter Fedon said last week that rebuilding 600,000 homes and other buildings may take eight years. Pakistan's authorities says it will take three to five years, but realistically it will take far longer given the terrain and weather conditions.